AseptiQuik Connectors provide quick and easy sterile connections, even in non-sterile environments. The market-leading design and ‘CPC Click’ offers complete fluid sterility, with a variety of connections to suit your specific process, including 1/8- to 1-inch sizes and genderless connections. The AseptiQuik Connectors allow you to transfer media easily with minimal risk of error. Eliminating the need for clamps, fixtures or tube welders, providing sterile, high quality single-use connections every time. The easy-to-use genderless design simplifies system integration and minimizes the risk of operator error. 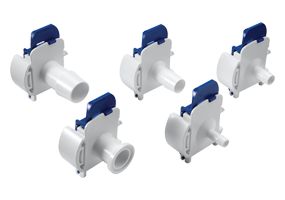 The aseptic connectors’ robust construction provides reliability without the need for clamps, fixtures or tube welders. CPC provide a full range of interchangeable 1/4” to 3/4” flow solutions with the quality and market availability you should expect from the leader in single-use connection technology. The easy-to-use design of the AseptiQuik connector is also available in Large Format 3/4" and 1" Connectors. Enabling sterile connections designed for high-volume 1” flow production environments. The genderless connectors use a three-step design to simplify system integration and minimize the risk of operator error. AseptiQuik STC Connectors integrate the AseptiQuik sterile connector and the Steam-Thru connector, allowing connection between stainless steel and single-use processing. 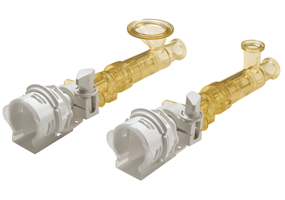 The AseptiQuik STC connector combines either an AseptiQuik G or AseptiQuik C sterile connector with a Steam-Thru connector that can be mounted directly to a stainless steel vessel. AseptiQuik STC connectors utilizing an AseptiQuik G sterile connector offer a genderless design, simplifying system integration at the aseptic connector end. AseptiQuik STC connectors utilizing an AseptiQuik C sterile connector allow system designers to incorporate a keyed female-to-male connection at the aseptic connector end. To further discuss the AseptiQuik aseptic connectors, and how we can help you. Please contact us, or request a callback at a convenient time to suit you.